The jury is out on NHRA’s latest move. 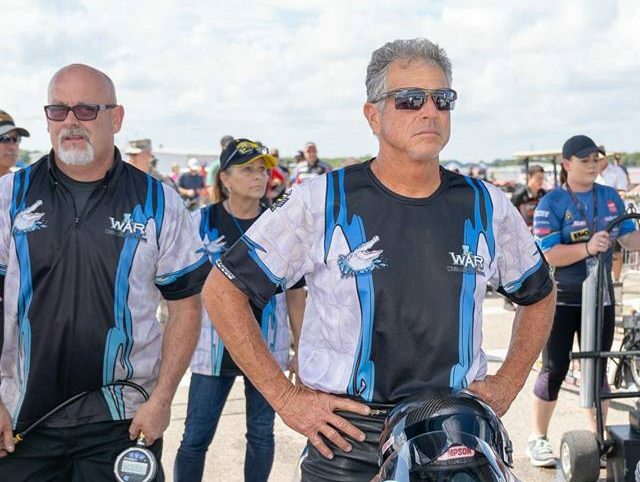 The last Suzuki racer to win a Pro Stock Motorcycle championship, “Alligator Man” Jerry Savoie commends NHRA’s effort and intention in trying to even the playing field by adding 15 pounds to the v-twins, but he thinks the change lacks effectiveness and sees better options available. Savoie, a devout Suzuki loyalist who has spent millions building and advancing his program since his 2011 pro debut, thinks giving his brand a fuel advantage or introducing a four-valve cylinder would be much more productive. Winless in the Countdown, Savoie’s last victory came in April in Charlotte. Suzuki’s last win came on Labor Day at the U.S. Nationals from Indianapolis by Savoie’s former teammate L.E. Tonglet. “It’s been disappointing,” Savoie said. Savoie’s engine is based off the iconic Suzuki GS 1100. It’s one of the primary power plants the class was founded on but it hasn’t been produced by Suzuki since the 80s. Some of the sport’s brightest minds, including current supplier Vance & Hines, have been squeezing every possible drop of performance out of this famous inline four-cylinder for decades. The problem is, Savoie, along with many others, don’t think there is much, if anything, left to gain. Savoie says the introduction of a four-valve cylinder head is the only stone left uncovered. Savoie says Top Fuel racer Mitch Brown’s popular billet Monster head won’t work for the class because a bigger camshaft than the head will accept is needed. The alligator farmer and 2016 champion read the comments on the Cycledrag.com Facebook page in response to the rule change and strongly refutes anyone who says the answer is for more Suzuki teams to have in-house motor programs. “I tried that when I first entered the class with Mark Peiser (veteran engine builder once with Don Schumacher Racing). I spent a load of money and it didn’t produce results. Most teams can’t do that. It would cost the average team $750,000 or more to have their own motor program. If I was 35 or 40 years old maybe I would do that, but at 60 I’m only talking about making a few races a year as it is,” Savoie said. According to Savoie, Buell racers had a big advantage in developing what has become known as the Gen 1 motor. “Victory came in and paid to develop the S&S motor. The teams didn’t pay for it. Their program is already set,” Savoie said. Savoie says the option to buy a dyno-proven engine from Vance & Hines in the $35,000- $38,000 is a much more viable for teams. Some have suggested introducing the modern and popular Hayabusa engine. Savoie quickly dismissed the idea. “It won’t work. It’s too heavy and it can’t make 370 horsepower,” Savoie said. As for NHRA adding weight to the v-twins, Savoie cringed for two reasons. First he feels it sends the wrong message to racers like Flyin Ryan Oehler who found gains over the off-season. “You don’t punish people for working hard. Instead help the slow,” Savoie said. Secondly, Savoie says many v-twin racers are overweight as is and will see little regression. Stripping anymore weight from the Suzuki is something Savoie views as senseless. “We are already starving ourselves to death,” said Savoie who races at about 145 pounds but walks around at 170. Savoie admires the NHRA Tech Department inquiring with him on ways to help his program. Savoie says they approached him four years ago and his response earned him respect and credibility. Savoie says the introduction of the new EBR bodywork and the approval of the 160 c.i. motor is what killed parity. As for the aero package, Savoie does not see much room for improvement on Suzuki’s TL 1000 bodywork. He’s had it in the wind tunnel and is pleased with the performance. “It doesn’t have much drag,” Savoie said. Savoie says there are limited options to make things fair. He knows changing the displacement maximum for the v-twins at this point in the season would not be acceptable. With the v-twins seemingly at an advantage, one may wonder if Savoie has ever thought about making the switch. Although disgruntled, jaded and frustrated, Savoie emphasized he greatly appreciates the work NHRA is doing to try to tighten things up. Savoie will continue his limited schedule this season with new teammate Karen Stoffer. Savoie says veteran racer John Hall will join his team in Atlanta and will stay for the remainder of the season. What are your thoughts on trying to maintain parity in this complicated situation? Let us know!